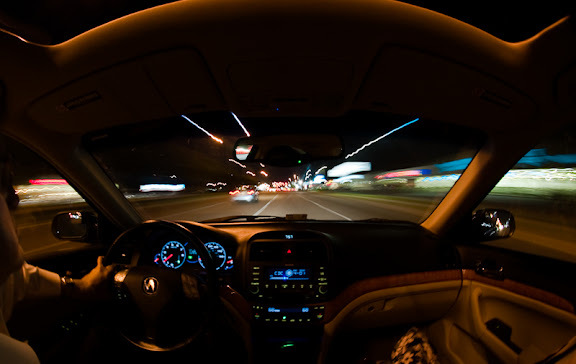 Out for a night drive with the camera and fish eye lens. This shot was made possible by using a nasty clamp to mount the camera hanging upside down from the center of the sunroof opening. You never know what I'll try next to get a picture. Canon Rebel XTi, 1.6 sec @ f/6.3, ISO 200, 8mm fish eye, remote shutter release. Very cool and artsy... it looks like a video game! It must be fun thinking up these shots!